Incident at Vichy by Arthur Miller isn’t as well-known or widely-produced as his more famous plays like The Crucible or Death of a Salesman but it contains some of his most astute reflections on human nature and, though written about events in the past, is perhaps his most prescient work. Set in 1942 in Nazi-occupied Vichy, France, a group of men find themselves detained in an abandoned building after individually being arrested by German and French authorities for reasons that are unknown to them. At first, they assume they are there for a routine document check but as they get called in one-by-one for questioning, they begin suspecting more sinister motives. What we, the audience, know, is that the men have been rounded up because they are suspected of being Jewish and after questioning, they may be sent to a concentration camp. Miller presents us with a collection of short character studies as each of the men react to their unknown fate in different but telling ways. 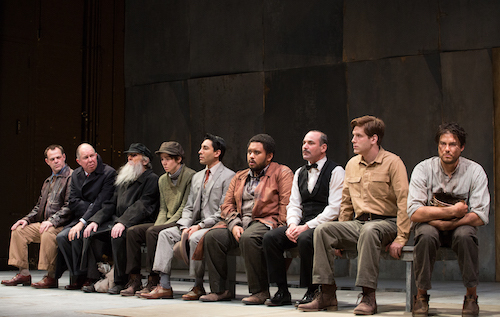 Director Alan Dilworth opts for a fairly straight reading of the script and stages the detainees sitting side by side on a long bench through most of the 90-minute, intermissionless show. Dilworth keeps the amount of stage business to a bare minimum allowing us to really focus on Miller’s dialogue. I thought the pacing of the show felt a little stilted at the beginning and that it lacked a sense of urgency. The dialogue is densely packed and it often feels as if Miller uses his characters to make a point rather than for their dialogue to sound natural. As a result of both the script and staging the early exchanges between characters lack a sense of flow. Luckily, after the half-way mark the play begins to pick up steam as tensions mount between the characters and the stakes get higher. One of the detainees, a French veteran named Leduc (Stuart Hughes) tries to rally the others in a scheme to overpower the lone guard at the exit. Monceau, an actor (Kawa Ada), resists the plot, concerned only for his own well-being and refusing to believe the horrible rumours of Jews being burned alive in ovens in concentration camps in Poland. The exchange illustrates how readily ordinary people capitulated to the Nazis, making it easy for them to pursue their agenda. Another character, a Major in the German army (Oliver Dennis), injured in the war and assigned to administrative duty, shows some remorse for his role in the systemic extermination of the Jews and wants to leave but is forced to stay. Even a soldier working to advance a horrifying ideology can have a modicum of humanity left inside of him. Other standout performances include, Diego Matamoros as von Berg, an art-loving Austrian prince and Stuart Hughes as Leduc. The pair have a great onstage rapport and play off each other well in their dialogues. Their confrontation near the end of the play is a highlight: Leduc berates the prince and forces him to accept his complicity with the Nazis but at the same time, the French veteran admits that everybody discriminates against “the other” and adds, “Even the Jews have their Jews”. It’s this exchange that best highlights the timeless quality to the themes in Incident at Vichy and makes it well worth seeing; the play feels just as relevant to the political climate of today. Incident at Vichy is playing through June 23, 2016 at the Young Centre for the Arts, 50 Tank House Lane, in the Distillery Historic District, Toronto.